Most men, especially those over 40, suffer from “Low T” or Low Testosterone. Low T can increase your risk of disease, stress, and depression. It can speed up the aging process and hinder performance in the boardroom and the bedroom. 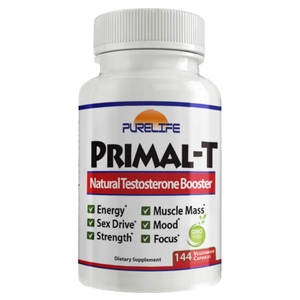 Fortunately, Primal-T is a safe and all natural way to combat Low T.
Primal-T features Calcium D-Aspartic Acid: a unique, more bioavailable form of D-Aspartic, a naturally occurring “D-Form” amino-acid that can boost brain function, elevate luteinizing hormone (LH), and raise testosterone levels. Calcium D-Aspartic Acid raises testosterone by over 42% and has more science supporting its ability to act as a natural regulator of testosterone release in the body than any other supplement ingredient. Testosterone has many physiological benefits including energy, sec drive, strength, focus, mood, and muscle mass. Lower risk of prostate cancer, heart disease, diabetes, osteoporosis and chronic inflammatory and neurogenerative disorders. Calcium DAA (Calcium D-Aspartic Acid): Raises Testosterone; Calcium bound to DAA shows superior solubility compared to regular DAA which increases testosterone's bioavailability and efficacy. L-Carnitine L-Tartrate: An amino acid that increases androgen (testosterone) receptors and aids in recovery from physical activity. Sensoril (Ashwagandha): An herb that lowers stress and cortisol levels; Increases energy and brain function; Aids in fat loss. Indole 3-Carbinole and Boron Glycinate: Support optimal performance through various means including lowering estrogen and cortisol; Boosts testosterone production. As a dietary supplement, men take 2-3 capsules twice daily. Can be cycled (Ex. 12 days on, 5 off) or used consistently. WARNING: Due to potent masculinizing effects, keep out of reach of women and children. Not intended for those under 18 years of age.